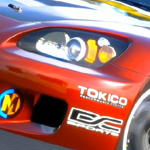 A selection of unique badges found in premium models of Gran Turismo 5. Many car manufactures created this unique badges for certain models, Nissan and Mazda are the most common ones to do this often. This are the ones I have found in premium models, I'm sure there are more, but I can't think of any at the moment. If you think I missed out any, please do let me know.